If you want to make your bank transactions easy and hassle free, you may want to consider online banking as almost all of the bank nowadays support online banking for their clients. Once you register your account online you can easily check the balance, pay your monthly bills and transfer funds to other bank accounts without leaving home, you can do all that in front of your computer with internet connection. But how about if you want to transfer large amount of money online? As a security feature of BDO online banking, it has a limit of 10k per day transactions, you cannot transfer more than 10 thousand pesos unless you register the other person’s account that you want to transfer with the money. 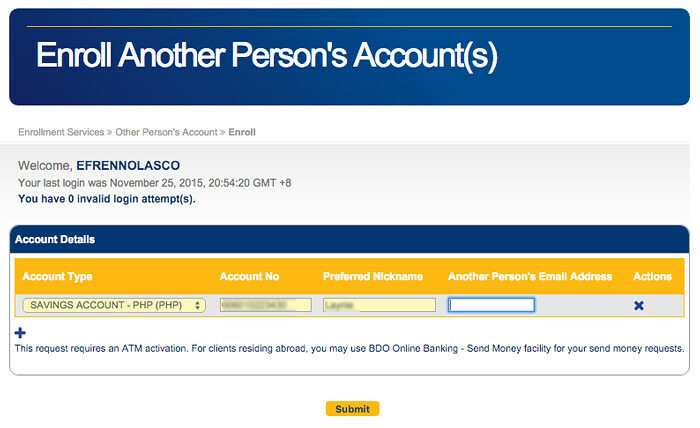 This article will show every step how to enroll other persons BDO account and verify it by activating thru BDO ATM machine. Once the account has been verified and activated, you can easily fund up to 250 thousand. 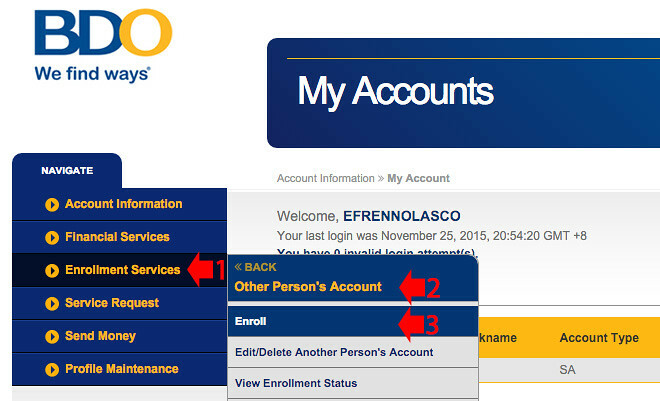 Login to your BDO online banking account and go to Enrollment Services > Other Person’s Account > Enroll. On the Enroll Another Person’s Account page, enter the account number of the person that you want to add, including the email address and the preferred nickname, once done, click Submit. A confirmation window will pop up, click ok to continue. 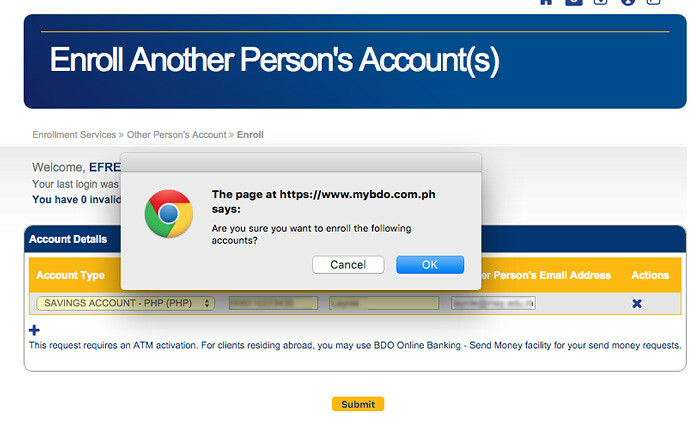 After submitting the account, BDO will process your request and you will be given an instruction thru email, text and the confirmation message like on the screenshot below to be followed to activate the account. 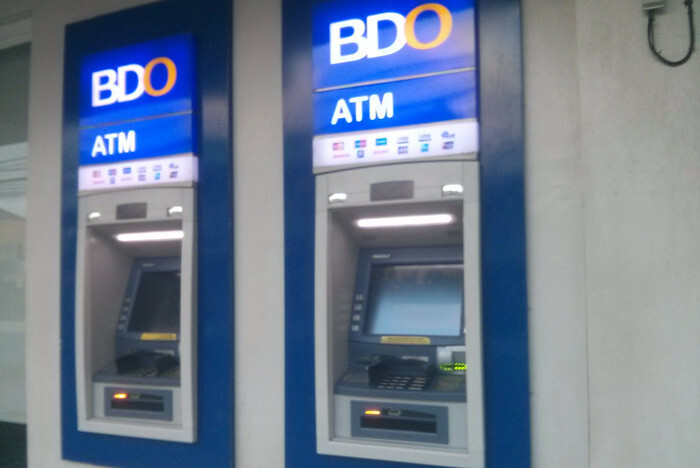 Now go to the nearest BDO ATM machine and follow the instruction to activate. 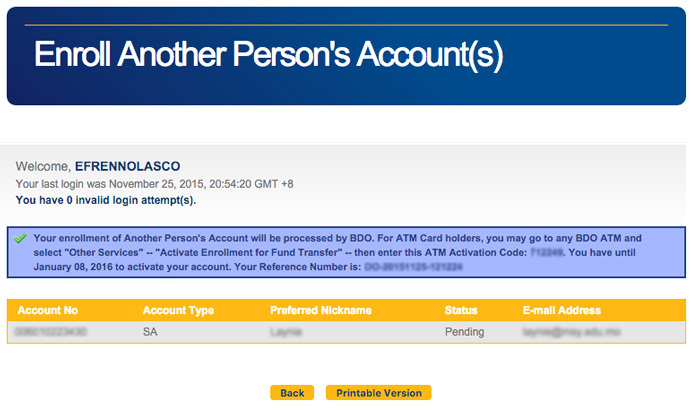 After you activated the added account, all you have to do is wait until it is accepted by BDO. When the other’s account is approved and enrolled to your account you can easily transfer large amount of money anytime anywhere without additional charges. This is very convenient, especially if you regularly transfer money to the same account, since BDO is charging 50 pesos inter branch deposit fee.